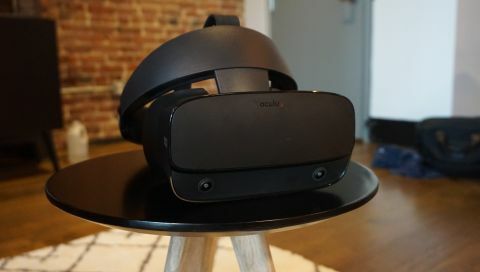 When rumors were starting to float around about a new Oculus headset that was going to be unveiled at a private event at GDC 2019, we were skeptical. All the signs were there, as was an invitation to an event held–you guessed it, on the first day of GDC–but the idea of Oculus unveiling a new headset six months after it unveiled the Oculus Quest felt… implausible. And yet, that’s exactly what happened. At a briefing held at GDC we got our first look at the new Oculus Rift S, a replacement for the Rift that no longer needs external tracking stations and offers an improved visual experience for your entire library of old Oculus titles. If you follow along with technology, the name should ring a few bells. Both Apple and Microsoft append an ‘S’ to their products to denote an iterative improvement (like the Xbox One S and iPhone XS, for example) as well as to indicate that the product is backwards compatible and will, in time, replace the original. All of that is true for the Oculus Rift S.
So what are we to make of the successor to the original Oculus Rift? It’s hard to pass any sort of judgment based on the two 15-minute demos and one hour presentation we had on it, but the Rift S promises to bring frustration-free out-of-the-box room-scale VR just in time for the next wave of big VR titles. According to Oculus, you can get your hands on the new Oculus Rift S starting in Spring 2019 (March, April, May of this year). If that’s confusing it’s because Oculus itself seems confused about the release date. The headset is supposed to launch soon but it doesn’t have a firm release date. What’s even weirder is that it’s supposed to come out on or at least near the same time that the Oculus Quest comes out. We’re going from two Oculus headsets total to two new models in a matter of months. To add to the trickiness of the situation, the Oculus Rift S and the Oculus Quest will cost the exact same amount: $399 (around £300, AU$550.) Oculus also couldn’t tell us when the new headset will release internationally, but says that it will follow up closer to launch. So is Oculus about to compete with itself? Well, yes and no. At our briefing, Oculus wanted to make one thing crystal clear: the Oculus Rift S isn’t the Oculus Rift 2. It’s an evolution of the hardware, absolutely, but not a radical departure from the base headset you know and love. For that reason and others, Oculus will phase out the original Rift in the near future. Both headsets will still be supported for some time (according to Oculus VP of Content Jason Rubin, “years”) but starting soon you’ll only see the Oculus Rift S on store shelves. So really what you’ll have to decide between if you’re planning on buying a new Oculus VR headset in the next year, is the PC-powered Oculus Rift S and more mobile Oculus Quest. Both headsets certainly have a lot in common, including the same game platform that will play most, if not all, of the same titles, and a shared software experience that will look familiar to anyone who’s used an Oculus product in the past. That said, despite no longer needs external tracking stations, the Rift S will still need to be tethered to your PC as it doesn’t have a GPU built-in–but means that it has tons of head room when it comes to graphical fidelity. That’s very different from the go anywhere nature of the Oculus Quest that doesn’t need to be plugged into anything but could feel a bit more stifled in terms of graphics. That said the Quest won’t have quite the same visual fidelity as the Rift S–a point we verified for ourselves after playing them one right after the other. That’s not to say Quest is a bad headset, in terms of optics it’s actually better than the Rift S, but GPU limitations means that textures don’t look as sharp as they do on the Rift S.
So which one should you buy? The Rift S is for those of us with gaming PCs who are looking for the more definitive VR experience and you also don’t need to worry about running out of storage (the Quest, remember only has 64GB of storage). If the idea of shelling out for a gaming PC doesn’t sit well with you–or if you’re the kind of person who’d rather have a portable system that you could take with you–the Oculus Quest is the better choice. Not only it more portable but, because it doesn’t have a wire, it’s probably a bit safer, too. The two hallmarks of the Oculus Rift S is the fact that it doesn’t come with external tracking stations–instead using five outward-facing cameras that will have a broad field-of-view to cover more gameplay area–and a wire that runs to your PC. The wire is an obvious step back from the completely wire-free Oculus Quest, but it's one that's absolutely necessary to power the next-generation of VR gameplay. The external tracking stations? Those are not. To that end, Oculus is keen to simplify the setup process of the Oculus Rift going forward. The new process, which was detailed to us in a presentation with Rubin, will involve using a new Passthrough+ mode that allows you to setup your Guardian without taking off the headset and should make that slightly convoluted setup process a bit more manageable for first time VR adventurers. Besides adding five external cameras to the headset itself, Oculus switched out the old tri-strap headset design for a more comfortable halo shape that is adjusted by turning a knob on the back of the Rift S.
According to Rubin this will massively help with how comfortable the headset is to wear for extended periods of time, and we noticed that it left fewer red marks on our face in between demos. It’s a win-win all around. A good chunk of the headset’s design, according to Oculus, came from Lenovo, who not only contributed to the overall shape of the headset, but will also be Oculus’ manufacturing partner for the headset. The other big changes to the headset, albeit they’re ones that you won’t be able to see, are to the specs. Namely, a new fast-switch LCD screen, a 2560x1440 resolution display and improved lenses that, we felt, were less reflective than the lenses used previously. There’s also a downside here that Oculus didn’t include in the presentation–and that’s the lowering of the refresh rate from 90Hz on the original Oculus Rift to 80Hz on the Oculus Rift S. That switch was made for the sake of developers apparently who now have an easier target to hit and keep a level performance across devices. When asked if gamers would notice a difference in the refresh rate, Rubin said the team at Oculus took the matter seriously and investigated how big of an impact refresh rate played in terms of comfortability. What they found is that jumping down to 60Hz severely impacted a game’s playability, but only a handful of playtesters noticed a difference between 80 and 90Hz. That said, no matter what science says, some fans of VR still won't be happy with a reduced refresh rate. In Rubin’s defense, we felt the same way when cycling between the Oculus Rift S and Oculus Quest, both of which were available to play at the event. In our time with the headset we were able to check out two new games, Vacation Simulator and the Oculus Studios first-party title Asgard’s Wrath, both of which demonstrated different aspects of the headset. Leisurely and hilarious, Vacation Simulator is being developed by the same folks who brought us the Job Simulator games, and puts us among robots doing their best to understand the archaic human rite of vacationing. But what this title was able to do for the Oculus Rift S was to demonstrate just how much better the optics are in the Rift S vs the original Rift–so much better in fact that we were reading written small-font text on postcards and signs without a problem. In fact, it was probably just as good as the HTC Vive Pro in that regard. Vacation Simulator was also a good place to see how the headset’s built-in speakers handled audio, as much of the game’s humor comes from the robot inhabitants’ quips and witty banter… which, well, could’ve gone better in our opinion. It’s not that the Oculus Rift S has bad audio, it’s just not quite up to par with the attached headphones on the original Oculus Rift–though we’ll have to revisit that opinion when we get one in our own home. The other game, Asgard’s Wrath, was shown off for the first time at the Oculus event and, honestly, it's become our most anticipated VR title of the year. Set in a Norse mythology-spun world, you’re asked to confront legendary creatures like the kraken and draugr spirits with nothing but the sword and shield and axe on your back. Because the game has a heavy focus on combat, we were able to spend some time checking out how the headset handled motion and fast response times. Here, to no surprise, it completely blew us away, even in spite of the reduced refresh rate. Combat always felt fast and fluid, bolstered by great hand tracking via the five external sensors, and couched with some cool mechanics like a throwing axe that comes back to your hand when summoned. If these games represent the future of virtual reality on the Rift S, we're definitely excited. Remember when we said Oculus doesn't want you to call the Rift S the Oculus Rift 2? It's because there's some definite fear around a second-gen product that could confuse and frustrate its dedicated player base. To reduce this frustration, Oculus is making the Rift S completely backwards compatible with the original Rift titles, and making the Rift forward compatible with the vast majority of games released for the Rift S and Oculus Quest with some minor exceptions. That said, while you'll definitely see the same games in each of the stores, buying one on the Oculus Rift S or Oculus Rift doesn't automatically score you a version on the Oculus Quest–it might, but according to Rubin and Oculus, that's a decision they're going to leave up to developers. As for the quality and quantity of games coming to the store in 2019, we were told that Oculus has already invested $250 million of its own money in developers and would invest another $250 million in the coming years. So far that money has brought us over 50 Oculus Studios titles, with more coming down the pipeline. "Oculus wants consumers to get an extremely large value from the hardware," Rubin said in our interview. "We're going to continue to support Rift going forward and we’re investing more than anyone else." As a replacement for the Oculus Rift, there's not much to dislike about the Rift S. It offers a higher resolution, easier setup and better tracking all for around $50 more than the current package. It sounds like an extremely good deal all things considered. What's a bit harder to wrap our heads around is the idea that Oculus will be releasing two headsets back-to-back that have the same price and play most, if not all, of the same games. It's not ideal, especially in a product category that can have horrible dry spells with little to announce for months on end. Here's hoping Oculus finds the same success with S that Apple and Microsoft found with their 'S' products.